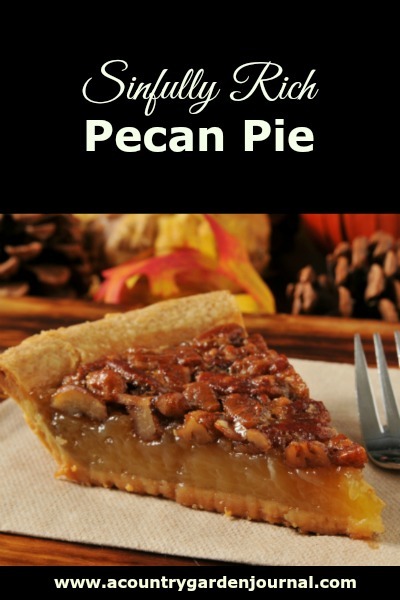 Hands down, Sinfully Rich Pecan Pie is one of my favorite dessert recipes. There are so many Pecan Pie recipes that proclaim to be the Ultimate, the Best, “Classic”, or Mama’s Favorite, that it boggles the mind. This is a family recipe that we have been using since the 1960’s and it is different from what is normally seen in cookbooks. You cook the filling on top of the stove, then pour it into the pie shell and bake it. Yes, it takes more work than the average Pecan Pie recipe. But whoever wanted an “average” Pecan Pie? I have seen one of my Uncles take a slice of this pie and bury it under mounds of sweetened whipped cream. And savor every last bite. Delicious! Cook the sugar, brown sugar, and light corn syrup to the boiling point. Take the pan off of the stove burner and stir in the butter. Beat the eggs in a bowl, and “temper” them. To “temper” eggs, you very gradually mix a tiny amount of the hot liquid into the eggs while stirring constantly. This will heat the eggs to the point where they won’t “scramble” when you add them to the hot sugar/syrup mixture. Lastly, stir in the chopped pecans. As an option, chopped walnuts may be used. Use the NEVER FAIL PIE CRUST recipe given in my “All-American Apple Pie” article. Mix the 1 tablespoon each of sugar and flour and sprinkle it into the pie crust. Be sure to coat the pie shell evenly, and get the sugar/flour mixture up the sides of the crust. This prevents the filling from soaking through the crust. Be sure to “score” the top of the pie into individual pieces (sections) before it entirely cools. It is easier to get out of the pie pan that way. 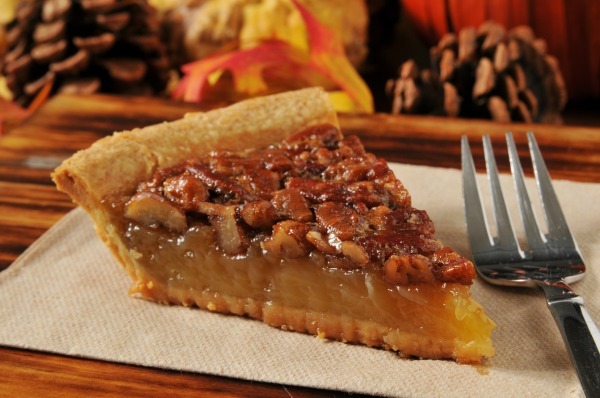 Pecan pie is my favorite of all pies! I love the sweet and salty flavor. I just can’t get enough! I will be making this recipe soon! I love pecan pie! Thanks for the recipe! You’re welcome, Sheila. Don’t forget to “score” the top of the pie into individual pieces (sections) before it entirely cools. It makes it easier to get it out of the pie pan that way.